Hello friends. I apologise for going AWOL on you, I've been having problems with my wisdom teeth (Seriously, why have we not evolved past these little bastards) so I've spent the past few days on the sofa with some - cough, lots of - chocolate milk and ice cream feeling sorry for myself. However, I am finally coming out the other side of my double antibiotic journey (yes I'm milking it for sympathy now) and will be back to normal posting ASAP. 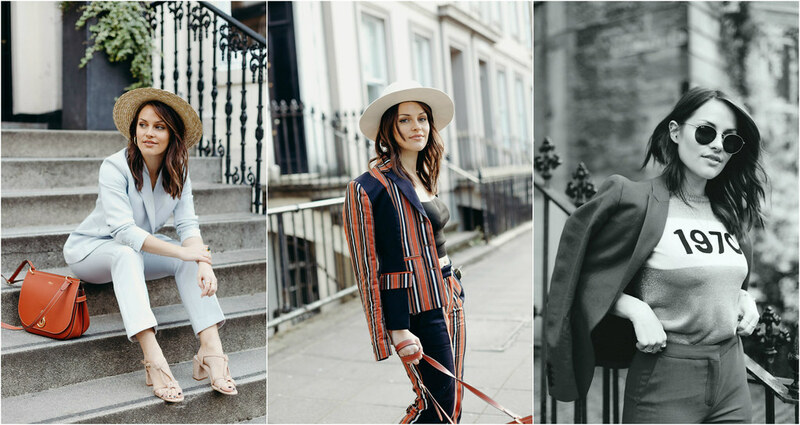 You may remember me saying that me and Kirsty shot three suit looks So you've seen Look One and you've seen Look Two, which that brings us to Look Three! Again this was one where I had to get the hems taken up (do a pair of trousers exist out there where I don't? I think not) but, aside from that, it fits like a dream. 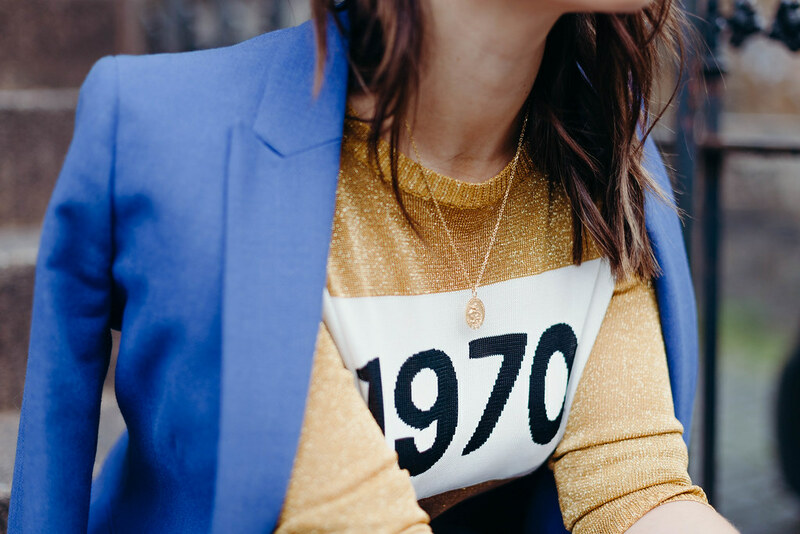 I really love blue and mustard together, so paired the suit with my Bella Freud baby, which is still one of my favourite pieces in my wardrobe, and added the little Toppers bucket bag for another pop of colour. And there we have it! I'm starting to move on to shooting Autumn/Winter content which is incredibly depressing. How am I supposed to welcome the cold weather with open arms when Scotland only graced me with a handful of bare arm days this 'summer'. God this has turned into such a woe is me post. I'm off to have some more chocolate milk. Here are the three looks together - because you can't beat a good collage - let me know which your favourite is! That suit is so cute! I love the bold blue color. Love this so much, the shoes are DIVINE! It's TOO hard to pick my fave, but I think this one tops it! 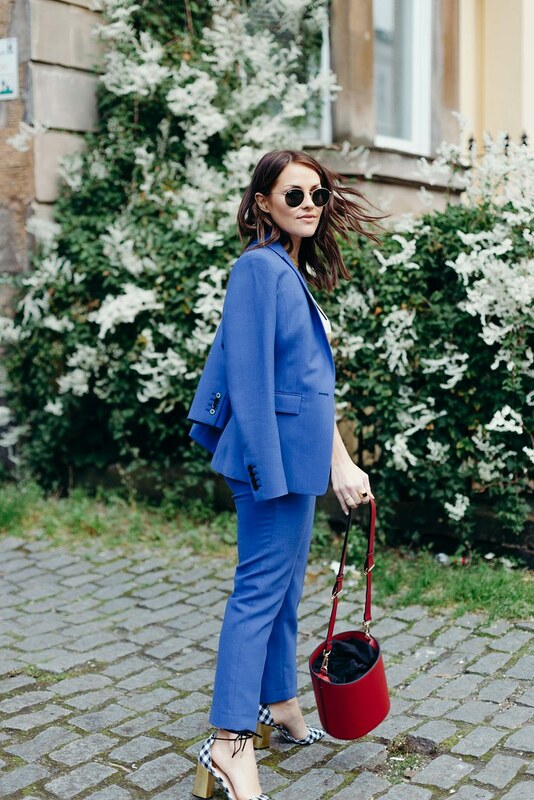 The colour of this suit! Gosh, what a beautiful fit too. Love it with that jumper. I need to check out the others to pick a face but it's probably this one. Gorgeous. Good old REISS.